Anxious or frightened children have difficulties understanding their experience and often react automatically and unconsciously. 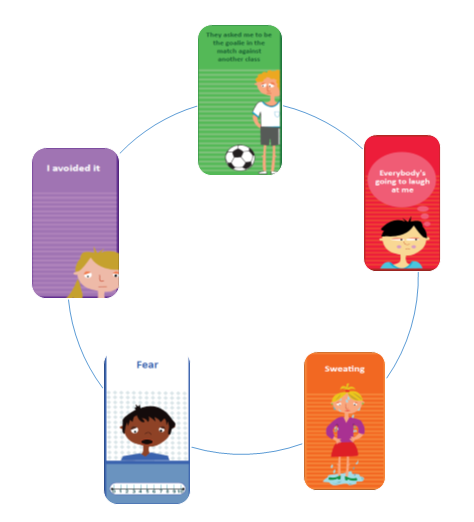 This article presents means to explain the cycle of anxiety to children, using the game Playing CBT. It also presents the elements of anxiety and provides a psycho-educational explanation for both children and parents about the three elements of anxiety and fear, and about behavior that intensifies fear. In my work with Playing CBT I spread the emotions cards on the table and ask the children to pick all the cards which depict an emotion that is similar to fear in their opinion. Children often choose the cards of fear, anxiety, panic, worry and surprise. For many children, these emotions are similar. The goal of this session is to start a discussion about the distinction between different emotions and help children understand that different emotions have different roles. What is the difference between fear and anxiety? What is surprise? When do you like feeling surprised and when not so much? Are surprise and panic similar at times? What is the difference between them? Fear – anticipation of actual danger – getting stuck in an elevator, insects, a lion, a speeding car. Concern / anxiety – anticipation of future danger. Thoughts about the future that deal mainly with the chance of the realization of negative situations (death, failure). Children tend to use the word worry while adolescents tend to use the word anxiety which is concern at a higher intensity. Panic – immediate alertness due to unexpected danger. Surprise – a situation that may be pleasant or unpleasant; doesn’t trigger a physiological reaction as much if it is perceived as pleasant. Present the children with the cycle of fear and ask them to fill out the cycle according to their experience. This explanation allows us to discuss the elements of the experience and the effect of each part on the next. Cognitive – anxiety is experienced through mental processes focused on danger or threat. The thinking style of children with a predisposition for anxiety is always focused on the chances of something negative happening in the future and the difficulty in coping with it. There are many types of anxieties and phobias and many thinking styles accordingly. The thinking style of children who suffer from social anxiety and shyness, will be expressed by thoughts such as “They will laugh at me” or “I will look weird and different from everyone” and “I can’t handle this”. While a child who feels anxious about their health may fear that a spot on their skin indicates a serious illness. Physical – anxiety is also experienced in the body; physiological arousal increases and prepares the body to fight, flee or freeze as a result of potential danger (an inherent primordial element). Children who are worried, often experience stomach aches and nausea, and children who experience fear will complain of sweating and a quick pulse – all in preparation for fighting or fleeing. Behavior – in our daily lives we react to emotions that are designed to elicit a survival behavior. That is, when we experience fear, our body prepares to flee or defend itself from danger. When we feel disgusted, our body will be deterred from something that might be toxic. However, modern life does not involve the hazards of nature, most of us do not live around predatory animals, so we need to examine whether our emotions are in line with reality, rather than reacting with an automatic emotion-driven behavior. Anxious children often tend to avoid anything that may provoke fear. They “make sure” not to evoke fear, which then causes their fear to intensify. It is important to note that parenting styles may also contribute negatively to the intensification of fear in these children. Parents who do not cope positively with their child’s (and/or their own) fear and let them have their way with negative behavior, prevent them from coping with their fear, and thereby let it intensify. Anxious children (but not only) find it difficult to describe their emotions and to distinguish between different emotional states. One way to examine difficulties in this issue is using the game Identifying Emotions – Game 4 . In this stage children learn to identify thoughts that cause them fear and worry about future events. Thus children can understand that thought provokes emotions and not events. An enjoyable and interesting way to achieve this goal is through the Event and Emotion memory game – Game 11 in which the children are exposed to the fact that thoughts provoke emotions rather than the events. Children usually come to this understanding half way through the game when they realize that any pair can be considered a match since it is the rationalization, the thought, that creates the match between event and emotion. A detailed explanation of the game can be found in the instructions booklet. Stage 4 – Identifying thinking traps. The key to changing our emotions is belief. That is, it is important that we understand and believe that the less extreme thought is the truth – in most cases it is in fact the truth. In order to realize this, one must begin to explore their thoughts by means of questions that correspond with the thinking style of exaggeration and extreme negative thinking. By examining whether a thought has ever been realized in the past, and if so, what are the chances of it being realized again? Children usually understand that the likelihood of recurrence is not as high as they initially thought it to be. These cards allow us to examine, together with the children, how to challenge and refute automatic thoughts. The next step is to use moderating thoughts. Following the understanding that a negative thought is not necessarily true, we may use a moderating thought that is better aligned with the actual truth (second wave CBT). 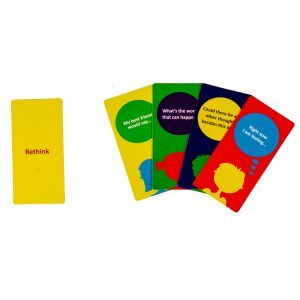 The Coping Thought / Negative Thought memory game from the Playing CBT kit is a creative way to learn about negative thoughts, coping thoughts and how to apply this principle. Once the children have learned all these steps, you may practice exposure to fear provoking situations, and start building the children’s scale of courage.